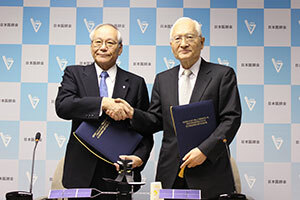 The Japan Aerospace Exploration Agency (JAXA) and the Japan Medical Association (JMA) signed an agreement to jointly conduct application experiments of the Wideband Internetworking Engineering Test and Demonstration satellite “KIZUNA” to support disaster medicine, after JAXA and JMA studied the utilization method of the KIZUNA in support activities and measures at the time of a large-scale disaster. JAXA and JMA will perform verifications and experiments together to provide useful support when a large-scale disaster takes place. 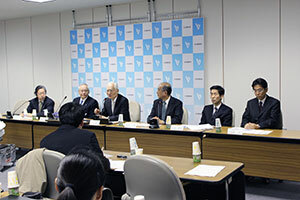 At the time of the Great East Japan Earthquake (March 11, 2011), the JMA held a TV meeting with local medical associations in disaster-stricken prefectures to understand their needs, and also dispatched a number of JMAT (Japan Medical Association Team) there. However, they found some issues in the method of information sharing with disaster-hit areas at that time. On the other hand, JAXA supported the area by providing satellite communication lines through the KIZUNA when the communication infrastructure was cut between the Iwate Prefectural Government and Kamaishi City or Ofunato City. As a lack of a communication method obstructed recovery, TV meetings and Internet communication via the KIZUNA were very useful at that time. For disaster medicine support activities, it is imperative to understand the actual conditions of shelters, the sick and wounded, patients and residents at a disaster-stricken area, then to share such information with all parties concerned. In a prediction of the Nankai Trough earthquake and a metropolitan earthquake whose hypocenter is expected to be directly below a densely populated area, damage is forecasted to be much bigger than that of the Great East Japan Earthquake, thus the usual communication environment may be in total chaos and no Internet service may be available. On July 26, 2012, JMA and JAXA held demonstrations with two scenarios of a huge earthquake in Sapporo, Hokkaido, and another one in the Tokyo metropolitan area. They conducted a TV meeting between the JMA, and Hokkaido medical association or Saitama medical association via the KIZUNA, and shared information such as medical charts and conditions of shelters at a disaster-hit area via cloud-computing through the Internet. With the above demonstration, the agreement was signed aiming at establishing a more useful information sharing method at the time of disaster via the Internet satellite under the common recognition of supporting as many disaster-stricken people as possible. Venue: Meeting Room 503, Japan Medical Association Bldg. Wideband InterNetworking engineering test and Demonstration Satellite "KIZUNA"